Are some brands of K-Cup brewers better than others? 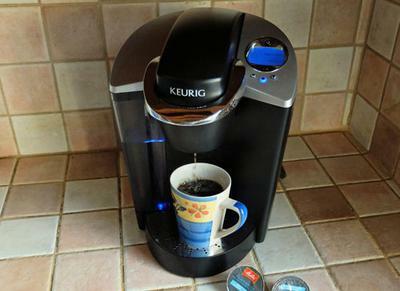 The Keurig B60 K-Cup brewer. I’m looking at buying a K-Cup brewer and notice that while Keurig seems to be the original maker, you can also buy them from other companies like Cuisinart and Mr. Coffee. Different companies, but all making K-Cup brewers. Are all these brewers of the same quality? Or is one brand better than the others? Yes, Keurig was the original maker of all K-Cup coffee makers. And then they started licencing the brew technology to other companies. If you look under the hood of almost all K-Cup brewers – from Cuisinart, Mr. Coffee and others – you’ll see that the brew head is the same. So you’re unlikely to find any difference in quality in that part of the brewer. And come to think of it, a fair amount of the innards of the machines are probably the same as well, and likely all made by the same manufacturer. The biggest difference will be found in the design and the shell of the machines. And, perhaps, some of the internal components. I have never pulled these machines apart, so can’t give you a definitive answer. I don’t know for sure. But my guess is that the quality is probably pretty much the same across all brands. The only thing that should set off any alarm bells is if you find a K-Cup brewer that is significantly cheaper than the others. That could be a sign that they are using different, cheaper components inside. The only real exception I can think of is the new iCoffee K-Cup brewer from Remington. That has a completely different type of brew head. Nothing to do with the Keurig method at all. I have done a video review of the iCoffee which you can see here. The Tassimo T55 Single Cup Home Brewing System. BUNN MCU Single Cup Multi-Use Brewer.